As part of the Institutional Repository's mission to deliver open access to the intellectual output of faculty, staff, and students of the University of Maine, we seek to deliver digitized, full-text content. To accomplish this, contributors are encouraged to meet a series of minimum standards when scanning hardcopy documents for conversion to digital files. The following standards are for public access documents, opposed to preservation-quality documents. The following, general information focuses on utilization of EPSON® hardware and software that is available in the Circulation Media Lab and Collaborative Media Lab at Fogler Library. For assistance using specific hardware and software, please consult with Circulation or Collaborative Media Lab staff at the Help Desk. 800 dpi, for images smaller than 5"x7". pdf = 400 dpi, regardless of image size. *Recommended formats for upload to DigitalCommons@UMaine. In order to be in Section 508 Compliance and make documents accessible for all users, scanned text documents must undergo the process of optical character recognition (OCR) to convert imaged text into ASCII characters that can be interpreted by screen-reading software. Adobe® Acrobat® Pro software, available on a number of public access computer stations at Fogler Library, has a text recognition function that can OCR. 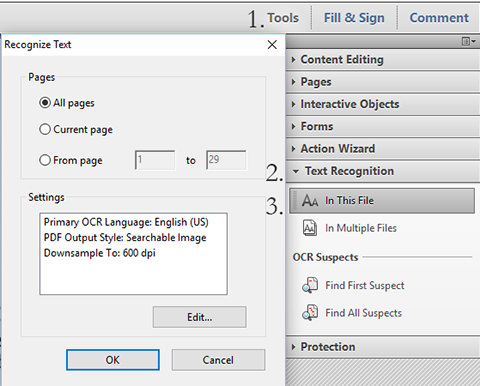 Steps for Text Recognition in Adobe® Acrobat® Pro. The program will process the document, displaying page by page progress. †The default primary OCR language set up for most software in Fogler Library is English (US). If your PDF document is written in a language other than English (US), before following the three steps above, click the "Edit" button below the settings box and select the appropriate primary OCR language. 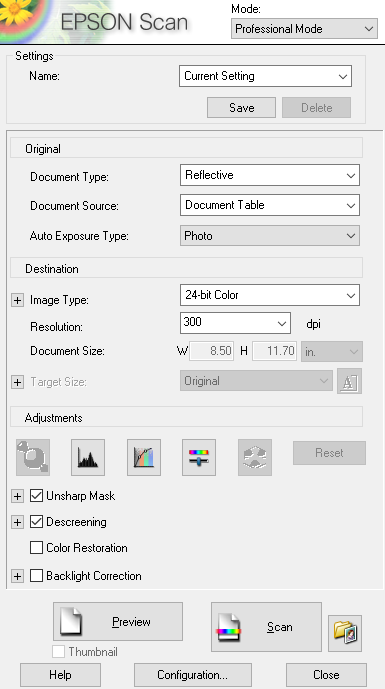 Leave the PDF output style setting as "Searchable Image" and "Downsample" size at 600 dpi. Then Click OK. While Adobe® Acrobat® Pro provides OCR processing, the program is not always 100-percent accurate. It is recommended users proof-read the OCR output before saving the final document. Under "Text Recognition," click "Find First Suspect." Review the "suspect" text for OCR errors. 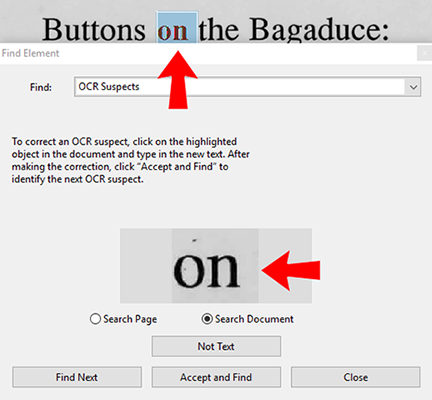 Correct OCR errors by clicking on the highlighted object in the page text and type in the correct text. If the OCR "suspect" is correct, click the "Accept and Find button" to move to the next suspect. If the OCR "suspect" is not a text character but is a glyph or image, click the "Not Text" button. When you have completed the process of reviewing the suspect characters, do a "Save as" and provide the completed document under a new name in order to preserve the original document. For complete instructions to create accessible PDF documents, please visit Adobe Training Resources.